It's summer, and that means it's time for big budget blockbusters! Blockbusters like Godzilla vs. Hedorah, the overtly environmentalist smash hit kaiju film of 1971! Complete with jaunty gunslinger Godzilla, psychedelic hallucinations and dancing skeletons, and a drug-addled monster that feeds on pollution. Join us as we discuss the acting ability of a six year old, and wonder whether exposure to the smog monster has altered Godzilla's consciousness. The score for the rest of the film is pretty comical, particularly when Godzilla takes flight and his theme becomes a college fight song. The film has a lighter tone and is aimed more directly at children, but thousands of people die in Hedorah's attacks. A longtime second unit director who worked on such classics as Throne of Blood and Hidden Fortress, Yoshimitsu Banno would never direct another feature after GvH. 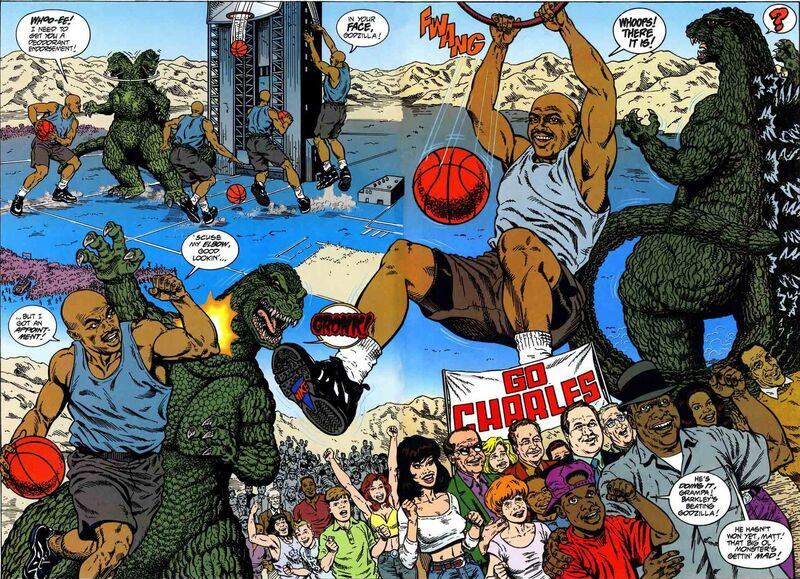 Our reference to Charles Barkley challenging Godzilla to a slam dunk contest was in fact a real thing and not a Hedorah inspired hallucination.